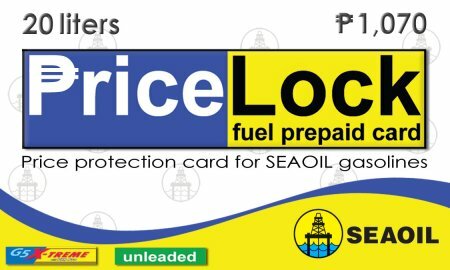 SEAOIL Philippines Inc., the largest independent retailer of petroleum products in the country, has introduced an industry-first prepaid card that pegs a customer’s gasoline purchase at P53.50 per liter. Company officials explained that the Price Lock Prepaid Fuel Card can be used to buy 20 liters of gasoline (G5 X-treme and Unleaded) from any SEAOIL participating stations. The selling period is from June 10-22, 2008. Each card costs P1,070 and is valid for 10 weeks (June 10 up to August 22, 2008). Since the price has been fixed, cardholders will have an easier time budgeting their fuel expenses as they will be insulated from further spikes in gasoline costs during the promo period. In the less likely event of a price rollback also during the period, i.e. the price goes down to less than P53.50 a liter, SEAOIL will refund unused (unscratched) fuel prepaid cards. The card is valid for a single transaction only, which means customers should use up its entire 20-liter value since any unconsumed amount, such as a 19-liter purchase, will forfeit the remaining card value. Only SEAOIL station attendants are authorized to scratch the silver coating of the prepaid card upon purchase and claim the same card after the customer fills up. Formed in 1997, SEAOIL is the first independent fuel company to put up a gasoline retail station, following the deregulation of the country’s downstream oil industry. It has since aggressively expanded, becoming the largest petroleum firm outside the Big 3 of Petron, Shell and Chevron (Caltex) with over 130 outlets nationwide and about 3 percent share of the retail market. Consistent with its thrust of innovation, the company pioneered the promotion of biofuels and other alternative fuels in the country, being the first to introduce the use of ethanol as a gasoline blend. In 2005, two years before the implementation of the Biofuels Act, SEAOIL already offered the first 10-percent ethanol blended gasoline or E10, now available in its nationwide retail station network along with the similarly mandated 1 percent biodiesel blend. pero, imposible yun…sige, go na lang sa prepaid card! doys last blog post..Ang Diyos sa Wheel of Fortune, at bakit pastora si Kris.